1.In a food processor, add your cashews and blend down to a fine meal. 2.Add in the coconut, and pulse until well blended. 3.Add in dates, vanilla, lemon juice and zest, and sea salt, and blend well, stopping frequently to scrape the sides of the processor with a soft spatula. 4.Slowly drizzle in water as needed to help blend, but don’t add too much. You don’t want the mixture to be too wet. 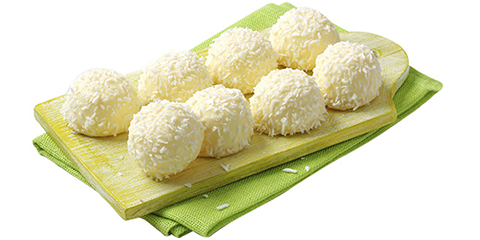 5.Using your hands, roll into ¾ - 1 inch balls, and roll the balls in some extra shredded coconut. 6.Spread onto a plastic tray or plate, and let them set in the fridge for a couple of hours.